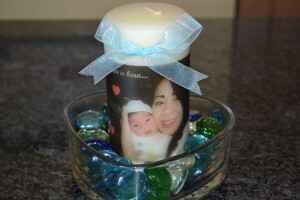 DIY - Create a Personalized Photo Candle | A Savings WOW! In just a few weeks, we’ll be celebrating Mother’s Day, so we want to give you a jumpstart on thinking about what to give the special mother in your life a thoughtful gift without breaking the bank. One of our favorite things is making a customized personalized photo candle. Read our guest post on Valpak’s website where we show how easy it is to make this gift! While you are on Valpak’s website, also check out our fellow Savings.com DealPros’ tips for making Mother’s Day special – Thoughtful Ways to Remember Mom “Across the Miles” by Lori Felix, 4 Strategies for Saving on Mother’s Day Celebrations by David Bakke, and Mother’s Day DIY Generation Necklace by Stephanie Brandt! Don’t forget to RSVP for our live Facebook chat with Valpak this Wednesday at 7 PM CST where we kick off this year’s “Stamp Out Hunger” event. We’ll answer your questions on how to save money on non-perishables, use stockpiles for donations and support your community year-round. If you’d like to learn how to make a meal for mom without busting your budget, sign up for the Meal Planning and Cooking Shortcuts Workshop on Wednesday, April 25th in Naperville, IL. I love that candle! What a great gift idea.